As part of our new Spotlight: Women & Non-Binary Artists, we’ve partnered with SoundGirls to share a weekly profile on the “mighty but marginalized” members of the arts and music community. This week, we’re featuring Marion Keisker, U.S. Air Force Officer, radio host…and the first to record a young truck driver from Mississippi named Elvis Presley. Marion’s radio debut was in 1929 (at age 11) on WREC in Memphis. She attended Southwestern College where she studied English and Medieval French and graduated in 1938. She was married in 1939 and had a son before divorcing in 1943. Marion went on to become one of the best-known female radio personalities in Memphis where she worked at virtually every station in town. 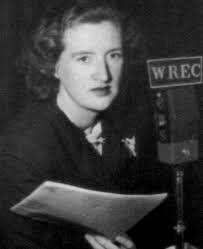 By 1946, she was hired full-time by WREC where she hosted a daily talk show, “Meet Kitty Kelly.” Management suggested her show be a “woman’s program” based around homemaking, beauty or storytelling for children. She refused, wanted to make a show that interested her generally and not exclusively around her gender. At WREC, Marion wrote, produced and directed 14 other programs. She worked on a weekly music show (which broadcast big bands) where she met Sam Phillips. Sam was a broadcast engineer and on-air personality for WREC. Sam had ambitions to open a recording studio and asked Marion to come work for him (as his assistant and studio manager). Marion, a single mom who knew little about music, wanted to help Sam fulfill his vision. Sam’s business card carried the motto, “We record anything–anywhere–anytime.” Sam’s vision was to record and produce black musicians – a progressive attitude for the time. What’s considered by some to be the first rock and roll single, “Rocket 88,” was recorded and produced by Sam in 1951 (it hit number 1 on the Billboard R&B chart). Blues and R&B artists like B.B. King, Howlin’ Wolf, and Ike Turner recorded at the studio in the early 1950s. The studio later attracted rock and roll, rockabilly, and country artists like Johnny Cash, Carl Perkins, Roy Orbison, and Jerry Lee Lewis. More on the studio’s technical setup can be found here. The next summer, Sam needed a singer for a song called “Without You,” and Marion encouraged him to try Elvis. While Elvis wasn’t right for the song, it opened the door to singing other tunes for Sam. Elvis was then introduced to a friend of Sam’s, guitarist Scotty Moore, and bassist Bill Black. On July 5, 1954, the three were in the studio recording. Elvis’s first record came from that session (“That’s All Right” and “Blue Moon of Kentucky”), and the songs were on the radio less than a week later. Elvis was 19 years old, had never played a professional gig, and hadn’t played with his bandmates until that session. On top of working at the recording studio and record label, Marion helped Sam launch WHER-AM, the first all-female radio station in the country. Both talent and staff were almost entirely women. WHER launched in 1955 with Marion being the first voice heard on-air. She read the news for two years at the station. Sam’s wife, Becky, was one of the first DJs at WHER. After her relationship with Sam became tumultuous, Marion left her job in 1957 and joined the US Air Force (where she was offered a direct commission as captain). After training, she was assigned to Vance Air Force Base in Oklahoma where she was the only female officer other than nurses. She was transferred to Ramstein AFB in Germany where she was Commander of the largest armed forces television facility in the world. In 1960, Army private Elvis Presley was in Germany doing a press conference when he stopped to say hello to one of the few women in the room, Captain Marion Keisker MacInnes. Marion went on to serve at Patrick Air Force Base in Florida (Cape Canaveral is controlled and operated by this base). She was stationed there during a lot of the space activities of the 1960s including manned and unmanned space programs. Marion retired from the Air Force in 1969 after 14 years of service and returned to Memphis where she became a key figure in the local women’s rights movement. Marion was co-founder and president of the Memphis chapter of the National Organization of Women. She fought to change the classified ads in the local newspapers so jobs would not be separated by gender. She was a member of the Women’s Media Group where she fought discrimination against women in the media. In the 1970s and 1980s, she was known for her broadcasting and theater work in Memphis. Marion frequently wrote letters to the editor to address issues of discrimination against women. Marion died December 29, 1989, after a long battle with cancer. To test Sam’s contention that Marion had never recorded anyone in that studio, I tried without success to find someone she had. I spoke to numerous people familiar with the Sun operation over the years, and all agreed from what they knew of Marion and the technical operation of the lathe, that not only could she have operated it, she probably did. But none could recall ever seeing her do so. I tried to contact her son, who she said was frequently in the studio with her, but was unable to get a response from him. I even asked Marion if she could suggest someone I might talk to, if she could give me the name of someone she had recorded—which I thought could at least settle the equipment question once and for all—but although we remained in frequent contact right up until her death, she never directly addressed the question. And so I am left with my own discomfiting conclusion. . .
All I can offer by way of explanation is Marion’s view of memory as a fleeting and fungible thing. “I’ve really become very much conscious and preoccupied with the subject of memory,” she said to me one time. “How subjective it is, how protective it is. It wasn’t that we didn’t know that things were happening, it’s just that there wasn’t enough time and energy [to write it down]. So I don’t know, it’s sort of like, whatever I may have suggested, it’s quite possibly not accurate. While it’s probable that Marion Kreisker could add “tape op” to her job duties at Memphis Recording Service/Sun Records, there are no known witnesses to her actually doing it. But, both Sam Phillips and Elvis Presley publicly expressed their gratitude to Marion – Elvis saying more than once Marion was a pivotal person in his career and Sam acknowledging many times he couldn’t have done it without her. Even with those accolades, Marion Keisker is often presented in the Sun Records story as merely a personal assistant or secretary to Sam Phillips. While Marion has been recognized by women’s rights organizations, Elvis historians and fan clubs all over the world, her contribution to the audio and radio community has largely gone unknown. We would like to recognize Marion Keisker as one of the pioneers of women in our community. Previous Sounds x Seen: ANIIML // OUCH!